I’ve repeatedly warned my readers that the trade war is potentially ruinous. Today, the International Monetary Fund (IMF) agreed with me. Stocks slumped Tuesday, after the IMF reduced its forecasts for global growth. The Dow and S&P 500 closed in the red; the tech-heavy Nasdaq edged slightly into the green. The IMF reported today in an update to its World Economic Outlook that it was now predicting 3.7% global growth in both 2018 and 2019, down from its July forecast of 3.9% growth for both years. The IMF cut its 2019 U.S. growth forecast to 2.5% from 2.7% previously, while it cut China’s 2019 growth forecast to 6.2% from 6.4%. The IMF specifically blamed the U.S.-China trade war and warned that the benefits of the 2017 tax cut package are starting to wane. In addition to worries about slowing global growth, investors also are fretting about rising Treasury yields, which are hitting multi-year highs. Signs of hotter inflation are stoking concerns that interest rate hikes will accelerate. The benchmark U.S. 10-year Treasury yield has surpassed 3.2%. Wall Street seeks a positive catalyst right now. It could come in the form of earnings. Third-quarter earnings season kicks off in earnest this Friday, with a busy day for the financial sector. Five major banks are scheduled to report earnings before the opening bell: Citigroup (NYSE: C), First Republic Bank (NYSE: FRC), JPMorgan Chase (NYSE: JPM), PNC Financial Services (NYSE: PNC), and Wells Fargo (NYSE: WFC). All five are expected to beat their earnings-per-share (EPS) performances of the same quarter last year. That’s the good news. For bad news, look overseas. Britain’s negotiations to leave the European Union are a mess. The British government today pressed for “intensive” talks to try to forge a Brexit agreement with the European Union, before the two sides meet next week at a summit in Brussels. Meanwhile, Italy is shaping up to be the next Greece. Rome is on the verge of a confrontation with Brussels over its budget, which breaks EU rules by showing a massive increase in deficit spending. Italy already has the region’s biggest debt; a debt meltdown in Italy could trigger a domino effect throughout global stock markets. The aforementioned risks should be manna for gold, and yet the yellow metal has underperformed this year. That’s because economic growth, especially in the U.S., has been unexpectedly strong, thereby superseding trade war and geopolitical uncertainty. 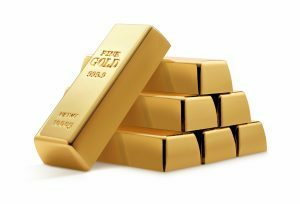 As interest rates rise because of rapid economic expansion, gold has lost favor as higher returns from “safe haven” assets can be found elsewhere. The strengthening U.S. dollar also plays a role in dampening gold. The value of the greenback typically follows an inverse relationship with gold. When the dollar rises against other major currencies, the prices of commodities, notably gold, usually fall and vice versa. That’s because most commodities are freely traded on global markets and prices are quoted in U.S. dollars. Foreign buyers purchase commodities like gold with dollars. When the dollar’s value drops, they have more buying power and the demand for the commodity increases. Similarly, when the value of the dollar rises, they have less buying power and commodities become more expensive, undercutting demand and sending commodity prices lower. China could soon change the equation for gold. During the escalating trade war, the power the U.S. has to implement tariffs stems from the dollar’s status as a reserve currency. But China has been accumulating a vast hoard of gold. If this storehouse of the yellow metal becomes big enough, it could give China the leverage to break the greenback’s primacy. There are signs that China seeks to promote the yuan as a national currency to rival the dollar, a development that would be bullish for gold. Analysts bullish on China-based educational service. Trading services provider initiates share repurchase. Citron Research tweets that this marijuana stock could soon double. Biotech falls as product gets negative FDA reaction. Biotech suspends blood cancer drug trials after adverse events. Cloud software firm slashes guidance. “How do I invest in companies that have an interest in cannabis?” — Belinda R.
Marijuana is a multi-billion-dollar business that’s been growing by double-digit rates every year. “Canna-business” is going mainstream, as increasing numbers of U.S. states, and entire countries such as Canada, legalize marijuana. The medical and recreational purposes of marijuana entail vast potential for growth. 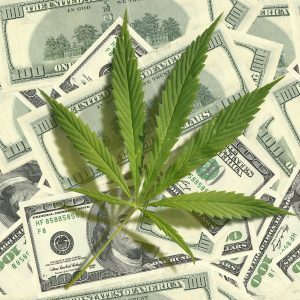 Those marijuana penny stocks? Avoid them! Most will go bust. They’re thinly capitalized, poorly managed, and overhyped. Look for biotech companies with sizable market caps that sport proprietary technologies, tangible products in the pipeline, and partnerships with Big Pharma. Avoid the tiny firms with catchy names traded on the pink sheets. Stick to companies with low or manageable debt. If earnings haven’t materialized yet, that’s okay, as long as revenue is gaining traction. Invest in a viable biopharmaceutical firm with real scientists on its research staff and seasoned executives in the C-Suite. The faddish, fly-by-night marijuana companies will go up in smoke.